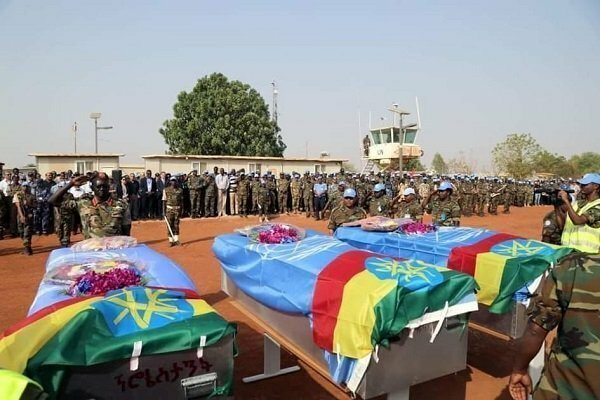 Bodies of three Ethiopian peacekeeping soldiers killed in a helicopter crash in Abyei yesterday is flown home, reported EBC. The bodies were sent to Ethiopia this morning representatives of Sudan and South Sudan government reportedly expressed condolence to relatives and families of the victims. MI-8 helicopter accident happened yesterday and four peacekeeping soldiers are killed. The helicopter crashed as it was flying from Kadugli to Abeyi, and crashed within the premises of Head of United Nations Interim Security Force for Abyei(UNISFA). The helicopter was carrying 23 peacekeepers and ten have sustained life threatening wounds. General Gebre Adhana Woldezgu, head of UNISFA, reportedly said that cause of the accident is under investigation.